Research is hard.There’s typing and looking at Google and all that stuff. This AP story has the following headline on ABC: “Ohio Diner Sold, Coffee-Cup Sign Used for ‘Alice’ Really? 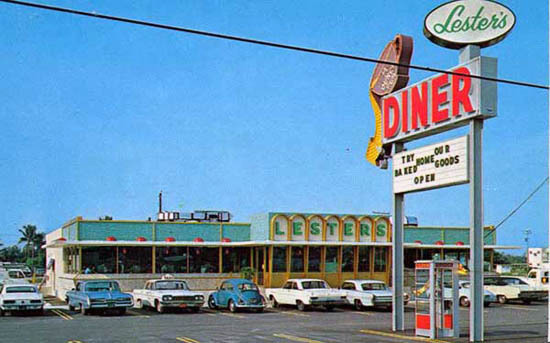 The sale of a northwest Ohio diner includes its iconic sign, which would look familiar to fans of the old TV sitcom "Alice." The sign outside Lester's Diner in Bryan features a tilted neon coffee cup that says "14 OUNCE CUP" and appears to be pouring out a stream of coffee that takes the shape of an arrow. 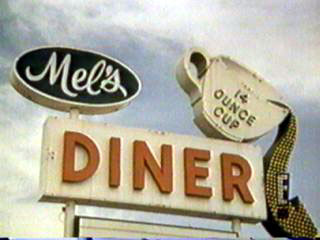 The Blade newspaper of Toledo reports the sign inspired the similar one for Mel's Diner on "Alice," which starred Linda Lavin and aired in the 1970s and `80s. Lester's aging owners closed the place in May and put it up for sale. So it’s not the same sign, but it inspired it. Well. This was the sign in the show. Where did Alice take place? Phoenix. Now take a look at this flickr page. Why, it’s a Mel’s Diner sign in Phoenix with a coffee cup that “appears to be pouring out a stream of coffee that takes the shape of an arrow.” Then there’s this one in Fort Lauderdale, Florida: same thing. Lester’s was a chain, it seems, and probably had more than three outlets - Ohio, Florida, and Phoenix seem too distantly spaced for a three-store chain. So the Ohio sign maybe was used for Alice. Or not. The end.